Along with running their gallery, Jessica and her husband, Ben Kinsley, are also artists, and on that visit we talked a little about her own work and she showed me her studio. I was struck by how prolific she was and the way her work combines both material processes and digital techniques. Jessica starts with the traditional medium of painting and then manipulates it through digital processes and collage. I was thrilled when she agreed to show some of her pieces with us. Much of Jessica's work is rooted in landscape and the natural world and references the language of Romantic landscape painting as a departure point for some of her abstract work. For SfDM, she exhibited two works in different media, but both connected to the idea of nature and the sublime. The first is a collage, part of a series of small works that can be seen here. She begins by creating abstract watercolor painting, which she then digitally scans, manipulates, and prints. The prints are then cut and assembled manually as collage, thus returning to their physical form. Next to the collage hangs Color Divers, a digital animation shown on a vertically-oriented flat screen display. Color Divers uses digitized, abstract watercolors as the starting point, but here it forms a backdrop to the subtle animation of figures moving through space. Created as a commission for Electric Objects, a digital art platform that aims to bring electronic art into the home, the screen displays what first appears to be a static watercolor image, beautiful in and of itself. But after a few seconds, a subtle animation appears — a transparent body tumbling into the depth before disappearing. As the background image dissolves into another painting, more divers appear. The animation was created through Rotoscoping, a process by which the artist draws directly onto video, layering the action onto the background. The result is a dreamlike space, where the falling of the figures is stripped somewhat (but not totally) of the anxiety evoked by images of people jumping and falling into a beautiful abyss. Indeed, in the discussion that followed Jessica's talk, we focused on the dissonant feelings that arise from seeing people fall — the exhilaration of watching cliff divers and the dread of seeing those iconic, terrible images of people leaping from the Twin Towers on 9/11. 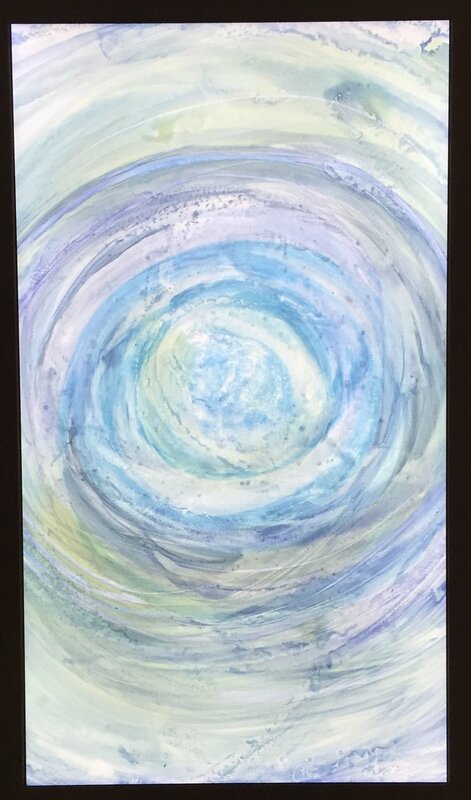 The abstract swirls of color in the collage evoke the sky and the ocean — or as Jessica puts it, "like staring into a baby's iris." There are whole worlds in there! In the same way the Hudson River School painters depicted the infinite nature of the universe with their expansive landscapes, Jessica's watercolors, abstracted and manipulated into animation and collage, give the viewer the feeling of looking into something vast and unending. In the context of our small, domestic gallery space, the pieces bring the outside in, as if someone cut two new windows into our living room wall that look out, not onto the brick wall of the building next door, but into a netherworld, where figures tumble dream-like through space and you can't quite comprehend it all. At a certain point in the evening, the discussion shifted to some of Jessica's other projects (she is involved in multiple collaborations), particularly The Stephen & George Laundry Line, where she has a full exhibition schedule of large-scale site specific work hanging outside of her building. That same week, The New York Times had published an article on the proliferation of small, home galleries, and it was nice to think of our projects as part of something bigger, though clearly fragmented, happening in New York. Also that week, NPR had run a radio feature on the Janks Archive, a collaboration of Jessica, her husband, Ben Kinsley and Jerstin Crosby, whereby they collect and archive insults from around the world. Earlier this year, they spent two months in Finland and Latvia, interviewing people and recording their culturally specific invectives. This summer, an installation of selected insults was on display at the 2016 Queens International, which closed at the end of July, though the archive continues to grow online. This is the first time the Society for Domestic Museology has shown a work of digital art, and it has been captivating. Screens are powerful. For those of us with small children (and even those without, I suspect), the screen can be a kind of enemy, enticing us to watch or to play, stealing time. When our children returned from camp and first saw Color Divers after a three-week screen detox, they thought it was a game and attempted to touch the screen when the animations appeared. But after the novelty of the screen subsided, it became yet another frame, one capable of displaying a whole museum's worth of artwork in just one space.